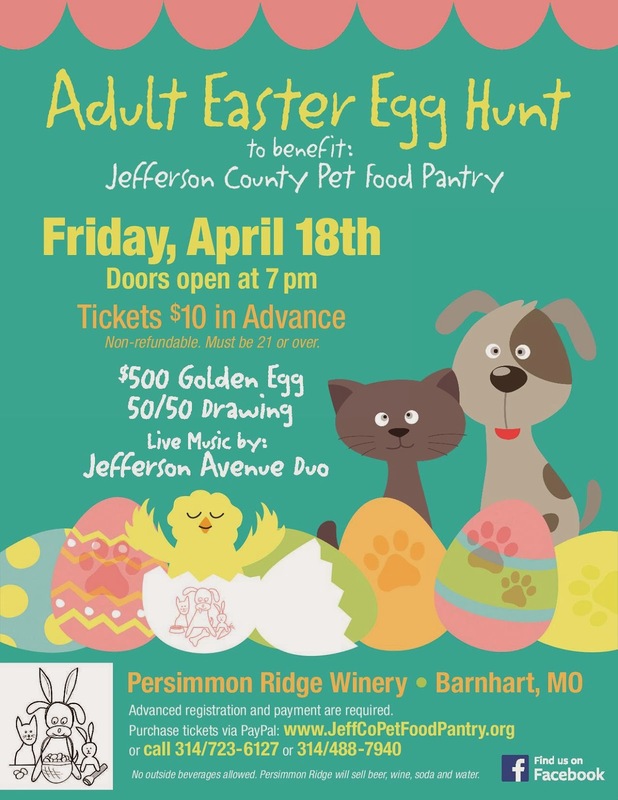 Jefferson County Pet Food Pantry : SOLD OUT!! 3rd Annual Adult Egg Hunt 4/18/2014!! SOLD OUT!! 3rd Annual Adult Egg Hunt 4/18/2014!! Thank you everyone. The adult Egg Hunt is Sold Out!! $10 Advance, $15 Door. Advance tickets strongly recommended. 250 capacity! Hundreds of eggs redeemable for prizes! Event will happen rain or “moon-shine”, dress according. Bring flashlights, lawn chairs and egg baskets. Limit of 8 eggs per person. DO NOT bring food, beverages or pets! Wine, beer, soda and water for sale at the winery. Beautiful country setting, winery and bonfire throughout the evening! Prepaid tickets will be at the gate. 1st 50/50 drawing 7:30 p.m. -8:30 p.m.
Hunt 8:30 p.m. (or dark) - 10:30 p.m. $500 CASH PRIZE!! 2nd 50/50 drawing 10 p.m. -10:30 p.m.
Silent auction winners announced 10: 45p.m. 11: pm End of event, goodnight and thank you!